การจัดการเรียนการสอนโดยใช้ปัญหา เป็นฐาน เพื่อพัฒนาสามัตถิยะทางการสื่อสารภาษาอังกฤษ ของนักศึกษาระดับประกาศนียบัตรวิชาชีพชั้นสูง ชั้นปีที่ 1 Development. 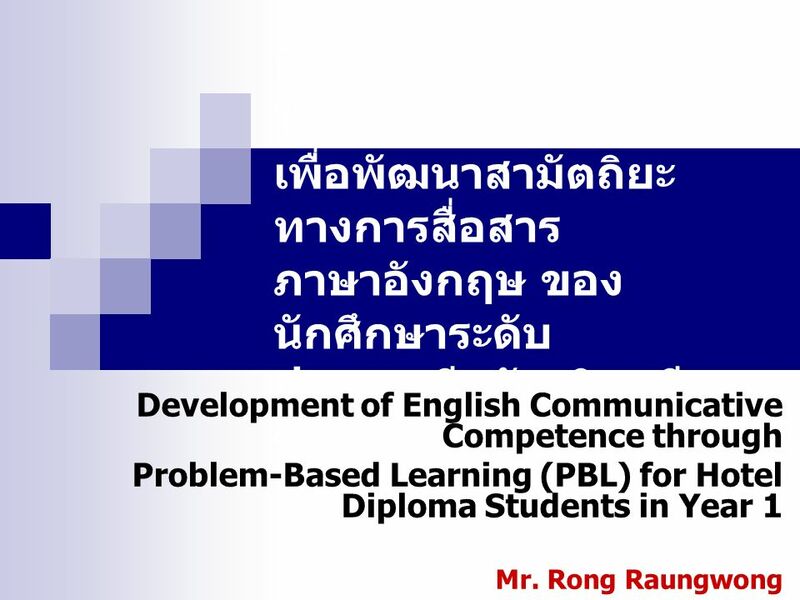 to develop English Communicative proficiency through teaching method of Problem-Based Learning (PBL). The 1st Year Diploma Students in Study Area of Tourism Industry in Semester 2 Academic Year 2012 of Aksorn Pattaya Technological College. Sample The 10 Hotel Diploma Students with Purposive Sampling in Semester 2 Academic Year 2012 of Aksorn Pattaya Technological College. Teacher-made objective test 30 items of 4 multiple choices compiled from university tests in English subject. Find the quality with only content validity (IOC) from 3 specialists about teaching English. 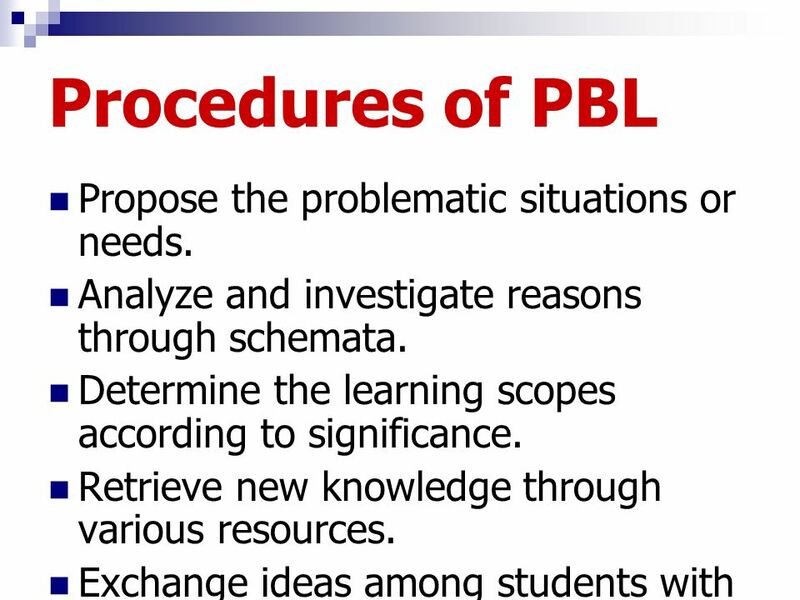 7 Procedures of PBL Propose the problematic situations or needs. Analyze and investigate reasons through schemata. Determine the learning scopes according to significance. Retrieve new knowledge through various resources. Exchange ideas among students with discussion. Generalize and apply new knowledge with daily life. 9 Summary : After conducting the experiment with PBL, the researcher found that sample students had the average score increasingly, from 16 to 20.9. 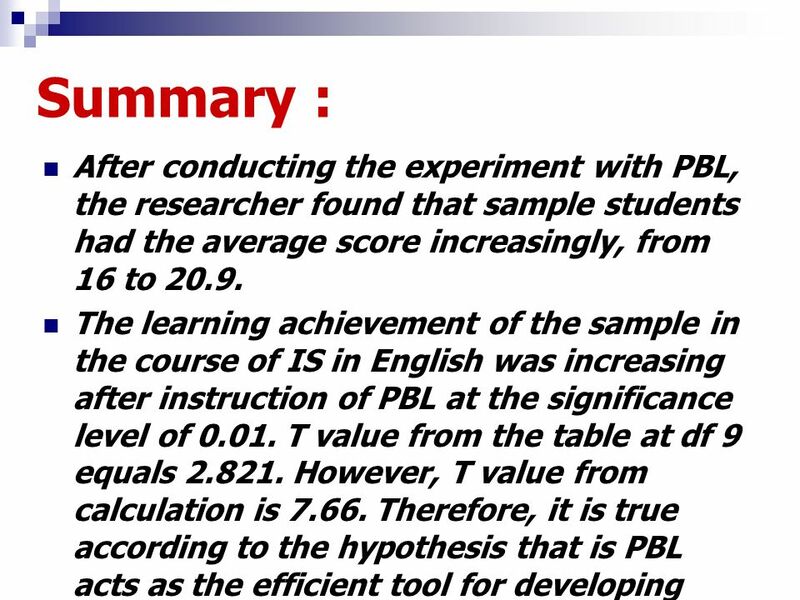 The learning achievement of the sample in the course of IS in English was increasing after instruction of PBL at the significance level of T value from the table at df 9 equals However, T value from calculation is Therefore, it is true according to the hypothesis that is PBL acts as the efficient tool for developing English communicative competence. 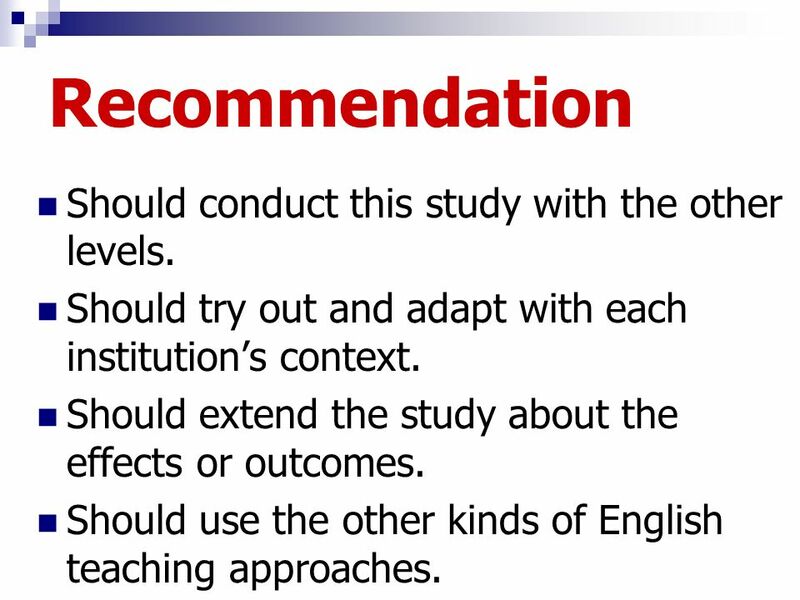 10 Recommendation Should conduct this study with the other levels. Should try out and adapt with each institution’s context. Should extend the study about the effects or outcomes. Should use the other kinds of English teaching approaches. 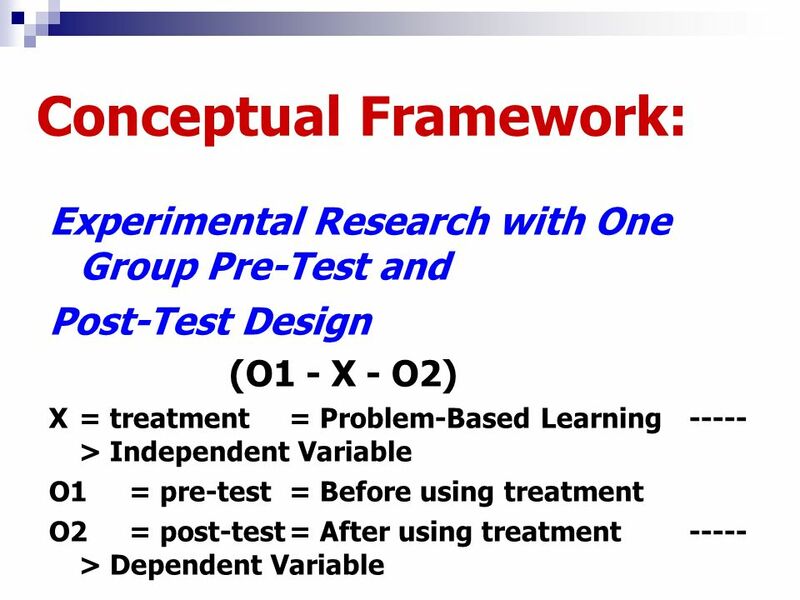 Should conduct the study with sample and control groups. Download ppt "การจัดการเรียนการสอนโดยใช้ปัญหา เป็นฐาน เพื่อพัฒนาสามัตถิยะทางการสื่อสารภาษาอังกฤษ ของนักศึกษาระดับประกาศนียบัตรวิชาชีพชั้นสูง ชั้นปีที่ 1 Development." Alices Adventures in wonderland Unit portfolio presentation Mrs Nighat Shaheen. NJ STEPS: Redesigning Education in New Jersey for the 21 st Century. 3rd Annual Conference of Educational Research Center on Teacher Education and Educational Measurement Broumana March 26 and 27, 2011. Research Design- Hypothesis The problem that we are researching is that students do not apply comprehension skills or strategies while reading traditional. Connecting Teacher Evaluation to Student Academic Progress Implementing Standard 7 0 August 2012. 1 Using K-12 Assessment Data from Teacher Work Samples as Credible Evidence of a Teacher Candidate’s Ability to Produce Student Learning Presented by Roger. Moving On High School Transitional Planning Guide Class of 2016 W. Mack Lyon Middle School. SMART GOALS APS TEACHER EVALUATION. AGENDA Purpose Balancing Realism and Rigor Progress Based Goals Three Types of Goals Avoiding Averages Goal. Science Breakout New Teacher Meeting 6, Year 2 March 31, 2011.